Smartcast and you shall be at the top of the world! While some of you might know this already, League of Legends has a built-in "Smart Casting" and "Self-Casting" feature. Basically, what this means is that like Karthus or Urgot's Q skill, when you smart cast an ability it will automatically cast on the point where your mouse is without you clicking the left mouse button. So how do you do it? Well it's simple. By holding down the SHIFT key, placing your mouse over the target or destination and then pressing the spell hotkey, it will automatically cast. 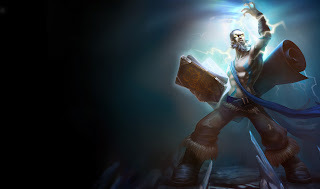 This is especially useful for heroes such as Ryze, Zilean, and Annie, who depend on fast fingers to maximize their burst potential. Self-Casting is a similar concept, it allows you to cast abilities like Morgana's black shield, sona, soraka, nidaleee heals, or even Zilean's ult on yourself without clicking around or trying to target your own hero during the middle of a battle. By holding down ALT and pressing the spell, you will automatically target yourself and cast that spell. This only works for friendly spells though, you can't put an AOE around yourself with this technique. If you want, you can even rebind your keys so that you're set on permanent smart casting (until you change it again.) To do this, simply hit ESC -> Key Bindings, scroll down to the smartcast section, and replace Shift + Q with Q, Shift + W with W, etc. You can also keybind smartcasting items as well with the latest patch. Would you say that smartcasting is something a player absolutely needs to do to be at the top of his/her game? And how about smartcasting with spells indicator ? u wot m8? how is your client supposed to know when to show an indicator for a spell if when you press a key (with smartcast activated) that spell gets casted to where you have your cursor at the moment...? much likely, but for some champs and some spells, like tresh's E, I've seen pros use standard casting to aim better.